Officials at the Stavanger Maritime Museum are laying plans to raise their historic sailing vessel “Wyvern,” which sank in a storm in the Baltic Sea last week while taking part in the annual Tall Ships Races. A Dutch sailor drowned during attempts to save the vessel from sinking. Underwater video taken of the wreckage has encouraged both museum officials and sailing enthusiasts that it’s possible to salvage the 116-year-old Wyvern and once against restore her to her former glory. The vessel, which was sailing from Århus to Helsinki in the Tall Ships’ Races, reportedly is lying at a depth of 55 meters after sinking between the Swedish islands of Öland and Gotland Thursday morning. The accident set off a major search and rescue operation that saved all 10 Norwegian crew members on board and two of the three Dutch sailors who had boarded in an attempt to prevent the sinking. One of them, identified as Dutch engineer Koen Van Gogh, went down with the ship but newspaper Stavanger Aftenblad reported that his body was recovered by the Swedish Coast Guard on Sunday. Bakke told NRK that the salvage operation can be planned from land, through use of the video, “and then we can get the equipment ready that we’ll have to get Wyvern up again.” The salvage operation is expected to cost around NOK 2 million (USD 330,000). Bjørg Tysdal Moe, acting mayor of Stavanger, said it’s urgent to raise the vessel as soon as possible, to avoid further damage to the wooden sailing ship that has a long a adventurous history. The city has received several informal inquiries from persons willing to contribute to the salvage effort, and Moe said the city would also contribute economically. The Wyvern, designed by the legendary marine architect Colin Archer, was built in Norway in 1897 as a pleasure craft and went through a variety of owners and many round-the-world tours before it was found in poor shape in a dockyard at Ibiza in 1978. Private investors in Stavanger brought the vessel back to Norway, where it underwent complete refurbishment before being handed over to the maritime museum. 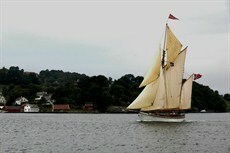 It since has taken part in five Tall Ships Races. The cause of its sinking last week remained unclear.